This enterprise technology and operating system enables more virtual servers in a single footprint than any other platform through legendary scalability, system management and performance. Gain 4.8x more workload performance. This hypervisor clustering technology helps reduce planned outages and balance workloads across z/VM systems. This toolkit provides enhanced capabilities to monitor and report performance data. Robust security software for virtualization helps protect your z/VM and guest system resources. IBM Directory Maintenance (DirMaint™) for z/VM helps manage z/VM’s user directory. Speed insight, backup and recovery for z/VM and Linux on IBM Z. Streamline system administration with point-and-click UI. Manage tape devices, volumes and mount requests. Protect data on z/VM and images of non-z/VM systems. Automate monitoring and management of z/VM VMs. 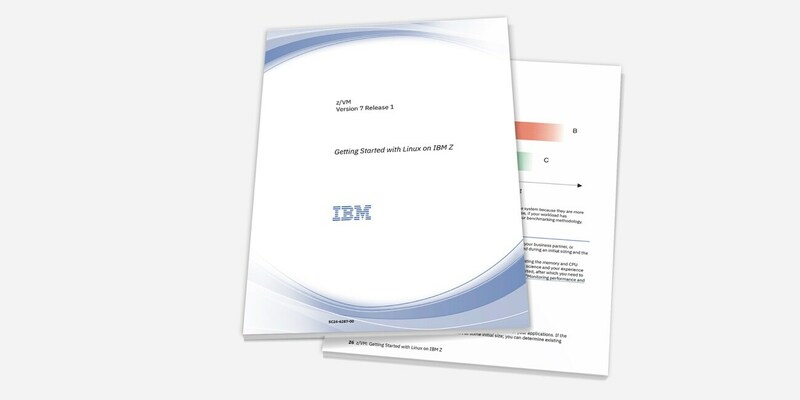 Get operational insights into z/VM and Linux on Z. Discover how to easily configure and use z/VM V7.1 functions and facilities for Linux on Z. This asset is designed to help system programmers or administrators learn to deploy Linux servers on z/VM. See what other products, tools and technologies z/VM offers. See how virtualization on IBM Z can help you gain up to 100% utilization with security, scalability and savings.